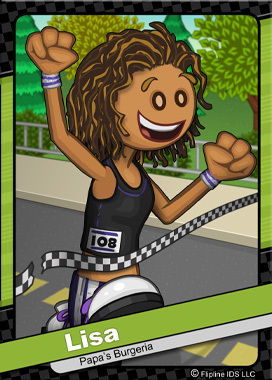 Lisa is an aerobics instructor from Burgerburgh, where she teaches weekly courses at the local Fit Frenzy Gym. She is an avid runner, and trains all year for the world-renowned Burgerburgh Marathon. Lisa has made quite a name for herself by coming in 1st place three times in the last five years. At each race, she is cheered on from the sidelines by her proud father, Franco.